Most motorcyclists (including the motorcycle lawyers here at Riderz Law) have strong opinions when it comes to noise and emissions standards. Many seem to think that emissions is a four-letter word, as EPA regulations have increased the cost of motorcycle-ownership and decreased their performance. Of course, take a ride through Los Angeles in the summer, and it’s difficult to argue that there shouldn’t be some degree of emissions controls. Without getting on our soap box about emissions standards, here is a quick overview of the emissions laws in the United States. California residents should note that our emissions standards are harsher than the rest of the country’s. We also discuss noise enforcement – another hot-button for motorcyclists. The general emissions laws for the country are explained below. Click on the following links for additional information. New street bikes have been touted as “EPA compliant” and/or “Euro III compliant.” These labels make reference to new emission regulations imposed by the U.S. and the European Union, respectively. Government regulations limit three byproducts of internal combustion motors: hydrocarbons (HC), nitrogen oxides (NOx), and carbon monoxide (CO). Starting in the late 1970s, emissions regulations were developed by the Environmental Protection Agency, or EPA for motorcycles. The regulations remained largely unchanged until 2003. Now, the federal EPA standards mimic California’s harsher standards, but are two years behind. So what does any of this mean? Basically, the original EPA restrictions, which went into effect in 1980, eliminated two-stroke motorcycles from street use. The new regulations force most motorcycles to use catalytic converters. It should be noted that thanks to California’s more stringent guidelines (and the fact that California accounts for more that fifteen percent of all motorcycles sold in the U.S.) most manufacturers have already been building their bikes in compliance with the new regulations. Custom Motorcycles and Motorcycle Kits. According to the 2004 EPA rules, a rider can own a bike built from parts by themselves or others called a “Kit Bike,” which is exempt from EPA emissions requirements. The owner can legally ride the non-emissions-compliant machine as much as they want. However, the catch is that every rider is entitled to only one Kit Bike for unlimited use in their lifetime. A rider can own more than one Kit Bike, but the mileage on these other bikes is restricted. Believe it or not, these new regulations for Kit Bikes and Customs Motorcycles are less stringent than the old rules. The 1980 standards for these bikes did not allow for these exemptions. In fact, most small manufacturers of engines are already compliant (or in the process of becoming compliant) with upcoming EPA standards. 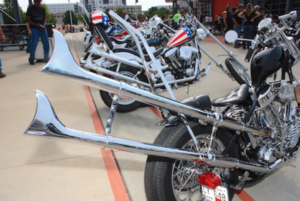 Many riders are familiar with the idea that a “modified exhaust” is illegal. This is an over-simplification, and is not entirely accurate. It is illegal to modify a motorcycle in a way that makes it become non-compliant with EPA emissions requirements. This rule has not changed since 1980. It is not illegal to change a motorcycle’s exhaust system. However, the new exhaust must still be in compliance with EPA standards. Many after-market exhausts are not, yet thousands of people install these after-market pipes on their motorcycles. How can so many people get away with putting on after-market exhausts that do not meet regulations? The answer is a lack of enforcement. In fact, enforcement of the modified exhausts rule is lax, to say the least. That is because it is up to the states to enforce it. As a result, many motorcycles on the road today are technically not within compliance. Several states, most notably California, have considered laws that would require smog and emissions checks for motorcycles (just like they already do with automobiles). In 1972, a bill was introduced at the federal level that would limit noise from automobiles, possibly including motorcycles. This bill floated around Washington for almost a decade, and was eventually abandoned in 1981, having never made it into law. As a result, noise standards for motorcycles are left to the discretion of state and local governments. These regulations vary from state to state, and their enforcement varies widely within those states. As with emissions regulations, many states prohibiting modification of an exhaust in a way that would make the bike become non-compliant with state or local noise statutes or ordinances. For a state-by-state list of sound-level guidelines, click here. If you have any questions about motorcycle emissions standards, or would like to speak with one of our motorcycle accident lawyers about any legal matter, please send us an email or call our toll-free hotline. We handle motorcycle accident cases throughout the state, including Los Angeles, Orange County, San Diego, Riverside, San Bernardino, the San Francisco Bay Area, and everywhere in between. We are happy to discuss your legal question or your options in the event of a motorcycle accident.